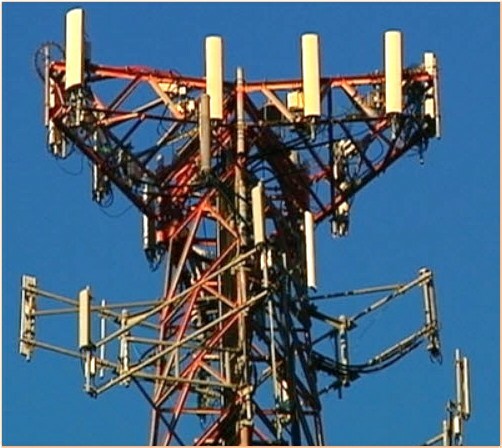 Are Cell Tower RF Emissions Something to Worry About? 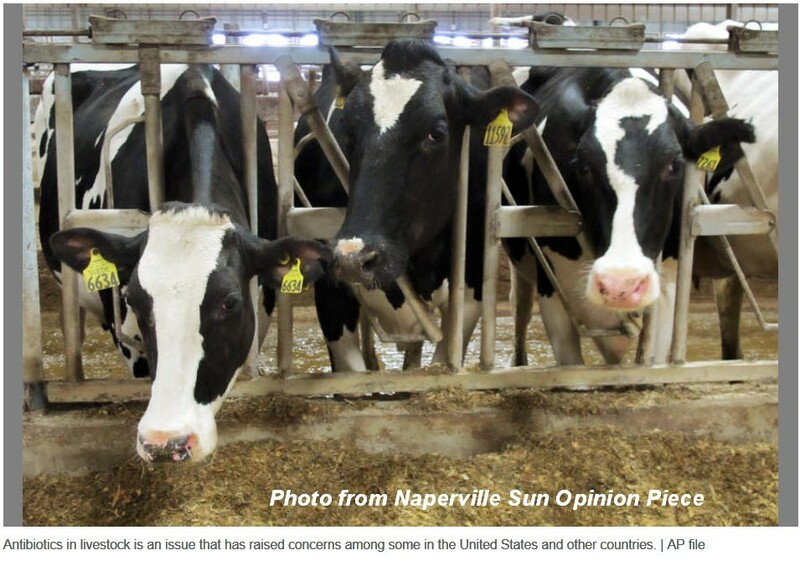 This article was prompted by an opinion piece in the Naperville Sun on July 30, 2014, entitled, “We should worry about things that are truly dangerous.” The writer of that piece is certainly entitled to his opinion, but in this article we would like to clarify some of the “facts” as well as highlight the somewhat snobbish nature of the Naperville Sun editorial. The general theme of the opinion piece was that parents should not worry about such things as radiofrequency (RF) emissions from cell towers being proposed for placement on school properties, but instead they “should worry about [other] things that are truly dangerous,” such as use of antibiotics in livestock and chemicals used in the plastic lining of food and beverage cans. What type of school would we have that did not listen to and thoughtfully consider the concerns of the parents? Would you want to send your children to such a school? By any standard, there is at least limited evidence that RF emissions negatively affect health, and there are many scientists who believe that the exponential and uncontrolled expansion of the wireless industry poses a serious threat to human health and the environment. Those who say there is “zero evidence” of harm typically view the issue as an “all or nothing” proposition. In an attempt to better illustrate this concept, refer to the figure below showing a “ladder” with various degrees of possible certainty for demonstrated adverse health effects from RF exposure. Those individuals who say there is “no evidence” are stuck at the bottom of the ladder stating that talk of low-level health effects from RF emissions is nothing more than “speculation.” These same people further state that in order to take any action to protect the public you must find a way to jump to the top of the ladder showing absolute proof of harm including the mechanism causing the harm. Those individuals advocating caution acknowledge that at least limited levels of evidence exist demonstrating that adverse health effects are caused by RF emissions. Some scientists and independent experts believe we are further up the ladder than others. Between speculation and hypothesis toward the bottom of the ladder and absolute proof at the top of the ladder is a range where precautionary measures may be warranted based upon an objective review of the available scientific evidence and its possible negative impact on society if nothing is done to avoid harm. The most basic precautionary action is to avoid RF exposure that is higher than necessary to achieve an intended purpose. If a school’s primary objective is to educate children in a safe manner, then intentionally exposing children and school personnel to cell tower radiation should certainly be viewed as not supporting the school’s core objective. Such exposure can therefore be declared unnecessary from a health risk perspective. On the issue of “RF levels” and for the Naperville School District 203 possible lease arrangement, have the expected RF levels for the school grounds even been disclosed? Discussion of “RF levels” can sometimes be a biased discussion tactic that ignores the possible effects of chronic exposure and probably also ignores the differences between localized and whole body exposure. The average American talks on a cell phone for about 15 minutes of a day (about 1% of the day’s duration). 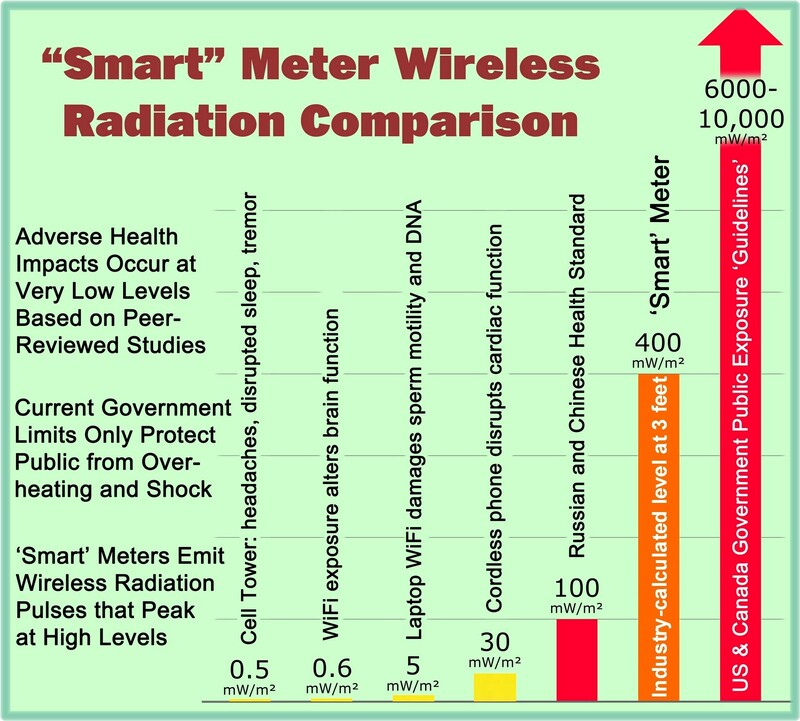 If the RF level from a cell tower is 1% of that a cell phone (as stated in the opinion piece), then the cumulative exposure to RF energy over a period of 24 hours from a cell tower would be equivalent to that from the 15 minute phone call. (For eight hours it would be more like a 1 to 3 ratio.) In addition, scientists who support the assertion that RF radiation is harmful even at low levels also generally believe that chronic exposure by its nature is more harmful than sporadic exposure. 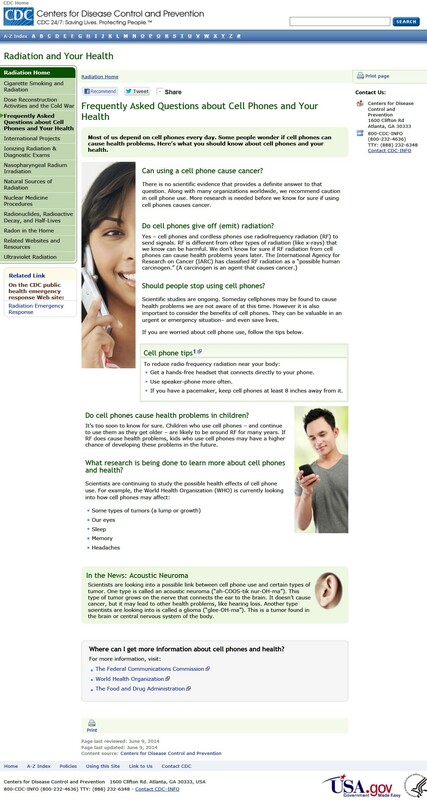 The Centers for Disease Control and Prevention (CDC) became the first federal agency to acknowledge the potential health risks from using cell phones earlier this year. Then, just last week, the agency backtracked from its earlier statements of caution. This entry was posted in Smart Grid, Smart Meters, and RF Emissions and tagged Cell Phone, Cell Tower, Health Effects, RF Emissions, Schools. Bookmark the permalink. 9 Responses to Are Cell Tower RF Emissions Something to Worry About? The extent of arrogant ignorance around this issue is astounding. Editors should not be so ignorant. Watch “This Is Not A Tree” on You Tube if this subject interests you. The wireless industry tends to ignore the elephant in the room when it comes to the safety and health of the “general public”. Not only with the cellular towers placed near or on school grounds but also the proliferation of wireless antennas on apartment, commercial, and industrial structures to such a frequency that they have been forced to acknowledged that they can no longer ensure the protection of people who may accidentally find themselves in front of a camouflaged or even an exposed antenna while in the course of their job. I have found a video account from a wireless industry worker willing to speak about the conditions he faces each time he goes to work on and around cellular antennas. The wireless industry and the FCC need to do something to stem the tide of people affected by the uncontrolled growth and regulation of the wireless industry before more innocent people are hurt. Industry will do anything to stop the true research from being made public. Researchers are often fired, bad-mouthed, funds for research withdrawn etc. Prof Olle Johansson has received death threats – he insisted on making his research available to everyone. Thanks for your comment. I had not heard about death threats against the Dr. and being one to confirm most everything placed on this website that can be fact-checked, I found the video shown below (interview filmed in March 2014). Video Clip Credit: Channel Alish (Alicia Ninou) and interview with Olle Johansson, available for viewing at http://www.TimeForTruth.es. Apologies, should have added the link. Yes it is very important to have a link to each statement made. June 11, 2011 (updated as of July 2014). Below are some of the key resolutions, appeals, and declarations released by expert scientific groups around the world since 1998, regarding the biological and health effects of both low frequency electromagnetic fields (EMF) associated with electricity and radio frequency (RF) electromagnetic radiation (EMR) generated by wireless devices. We have been fighting this EMR and RFR for over a decade and the smart grid implementation since January 2010, and have informed literally thousands of people.